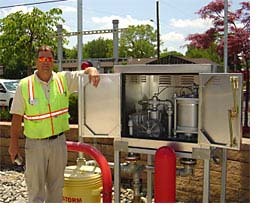 ''I have been involved with gasoline refueling operations for about 20 years. To meet regulatory requirements, I have always been forced to purchase products with a negative net present value. In other words, we pay to meet the regulatory requirement, but we receive no financial reward. The PERMEATOR is the first product I have purchased that actually helps the environment while at the same time generating significant fuel savings. Thus, we can earn money - through product savings, while at the same time being environmentally responsible.